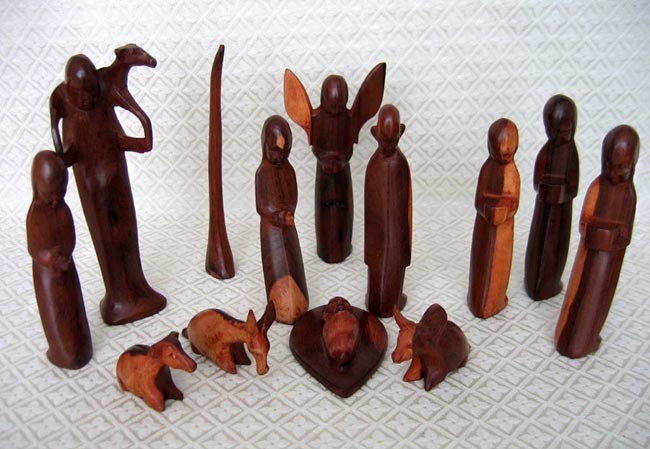 This Nativity set is carved from rose wood by Wilson Mukenge. Artisans like Wilson do their carving during the day, and then often work other jobs (such as security guards) during the night to meet their financial needs. The set includes 13 figures: The Holy Family, a star on pedestal (the star is missing), an angel, a shepherd holding a lamb on his shoulders, a shepherdess, an ox, a donkey, a sheep, and three wise men. The shepherd measures 8 inches tall.